A rose bush that produces pink roses. To make sure your plants are healthy and productive all summer, give them attention early. Correct cut made on a 45 degree angle a quarter-inch above a strong outer bud. Question: We recently moved into a new home that has several beautiful rose bushes. I have never grown roses and do not know how to care for them. What should I be doing now to keep them healthy and blooming this summer? Answer: Roses can seem intimidating until you get to know them, and then once you understand them you will find them quite easy to grow. Even when neglected they often bloom, although they may not be as healthy. I have even heard them humorously referred to as weeds, since they can be quite hardy and tolerate poor care. But with a little attention, your roses will be healthy and bloom more and bigger flowers. And spring is the perfect time to begin giving them some attention. The first task is to prune. In our area, mid-February through March is a good time to prune, before the leaf buds begin to open. A general guideline is to prune the same time the forsythia blooms. A good pruning encourages new and vigorous healthy growth and bigger blooms. Begin the pruning process by removing diseased, damaged or weak canes, cutting at least an inch below the damaged section. Then remove those that are weak or thinner than a pencil, any growing towards the center and those crossing or rubbing against other canes. For older bushes, you will want to cut out one or two of the oldest canes each year. The goal is to open up the center of the bush so that it has a vase shape with three to five strong canes remaining. Then cut these canes down to about 12-18 inches for a Hybrid Tea or Grandiflora roses, or more moderately prune to 24 inches for a Floribunda. 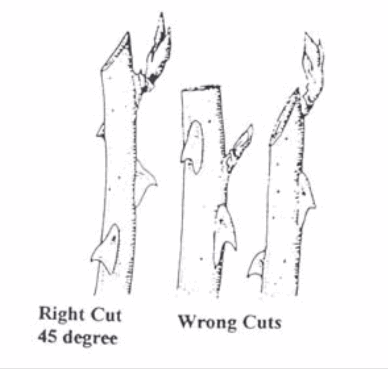 All cuts should be made on a 45-degree angle on a downward slant, away from the bud, and about a quarter inch above the outward facing bud eye. After pruning, the next step is fertilizing. Roses enjoy a good feeding in the spring when they begin growing and need the nutrition. There are a variety of all-purpose rose foods on the market, both organic and inorganic. Organic fertilizers are derived from formerly living plant or animal matter. Most commonly used are blood meal, cottonseed meal, bone meal, alfalfa meal and fish meal. Manures would include chicken, rabbit and steer. Organic fertilizers generally release more slowly, as they need to decompose in the soil before being usable by the rose bush. Inorganic fertilizers are man-made compositions and generally provide a quicker release. The Portland Rose Society produces a fertilizer with a formulation of 15-10-10, which means it contains 15 percent nitrogen, 10 percent phosphorous and 10 percent potassium. You can also find inorganic fertilizers at garden retailers with varying formulations, such as 9-14-9, 6-9-6, or 12-4-8. Fertilizers are applied to the soil around the bush and gently worked into the soil and then watered in. Continue to apply fertilizer every six to eight weeks during the growing season. For both types, follow the recommendations on the package for appropriate application amounts. To help ensure the newly pruned bushes are free of any lingering pests, now is also a good time to apply a dormant spray. Many garden pests and diseases such as fungi spores do not die over the winter. Instead, they hang out in the soil, leaf buds and on branches. Some can be eliminated by applying a dormant spray before the plant sends out new shoots, thus suffocating the pest and spores of overwintering fungi. Now the bushes are ready to grow. To ensure they have vigorous, healthy growth and big blooms, they will need regular water. Roses should receive 1-2 inches of water a week — a rule of thumb is two to four waterings a week for 30 minutes each time. Ideally, water so as to not splash the leaves. Keeping them dry will help to reduce disease problems. Watering early in the day is also a good option — should the leaves get wet, they will have all day to dry off. Now stand back and watch your roses bloom!